People born specifically on the 12th of June are imagined to be patient self starters who like the majority of Gemini's is naturally good at getting their own way. The ruling astrological planet for this particular day is Jupiter making you destined to be highly optimistic, free spirited and sociable. If you have this birthday a generous giving nature is bestowed upon you along with a realistic, responsible and dutiful attitude. Your clever quick wit allows you to make friends easily and gives you a fun loving, young at heart approach to life. Curious and expressive you will also usually be prone to moodiness, restlessness and become bored fairly quickly. Individuals with a June the twelfth birthday are enthusiastic and alert with a desire to be constantly busy. Your multi tasking abilities and fondness of diversity encourages you to be resourceful and flexible. A believer in fate you tend to cope well with change and rarely succumb to defeatism. Early decisive work choices are ordinarily the norm to a person born on the twelfth of June as you often know exactly what you want to do. You are also lucky enough to possess the vision and perseverance to aim high and get where you wish to be in the career department. You seem to do particularly well in teaching or caring supportive professions. With your need to keep active and for plenty of variety it is unlikely that you will enjoy a slow moving boring job. Money is a bit of a motivator to you when working so you are usually quite careful to ensure that your budget stays balanced. For a Gemini, the person born on the twelfth day of June is typically tender hearted and usually let their head rule their heart in romance matters. Despite this you are enthusiastic about love and prone to marry early. A natural ability to cheer others up makes you full of thoughtfulness and patience but you can be more critical in a personal relationship than most twins. You have the necessity for a partner who can cope with your flirtatious side and supply the mental stimulation and affinity that you crave. In a loving long term relationship with a soul mate you need to feel deeply connected and generally view intellectual compatibility more important than physical and emotional connections. Imaginative and affectionate you find romantic gestures easy but they become more meaningful as you mature and gain deeper insight into the needs of your lover. General good health experienced by those born on June 12th can sometimes suffer due to your keenness for juggling many tasks at once. You have the occasional tendency to frequently overtax your body and mind energies leaving you drained of your reserves. Slowing down a little and taking time out to relax could have lots of healthiness benefits. People born on this day may also be inclined to be slightly nervy and worry about things more than necessary. You should ensure that your diet is varied as if you are low on any vitamins it is likely to soon show in your skin condition, stamina and performance. Your main strengths of character are probably your ample degree of sociability and being disposed to being filled with optimism. These positive traits give you a favorable outlook and the expectation of happy conclusions. Your youthfulness and preference for a wide range of interests are additional fortes that present you as fun and interesting to know. Recognizable personality weaknesses for those born on June 12th are seen in the moody, restless part of your temperament. Other negative tendencies are your low tolerance of boredom, self unawareness and proneness to be every now and then rather judgmental. 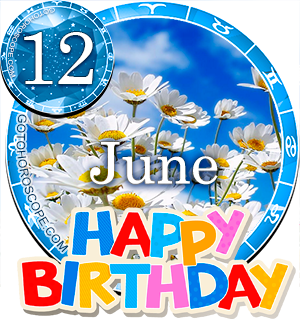 Being born on the 12th of June grants you industrious independent thought processes directing you to often set numerous ambitious goals. You could find that you need to pay close attention to the details of desired plans but your strong refusal to give up keeps you motivated and looking forward in the face of any setbacks. You appear to get as much satisfaction from encouraging and helping others to accomplish their aims as you gain from achieving something yourself. Where dreaming is concerned your penchant for realism can be influential in simplifying the wishful ideals usual in your dream contents. As you were born on the twelfth day of the month the one and two in your birth date dispense you a Root number of Three. This numerical reference to your birthday has the keyword 'Innovation' pinpointing your ingrained senses of responsibility and duty. The Tarot card associated with your birthday is the 12th card in the Major Arcana picturing the Hanged Man. This is a symbol of your contemplative caring nature and skill at recognizing and overcoming limitations. The luckiest gemstone chosen for June the twelfth birthdays is Amethyst to be worn for powers of concentration and increased happiness. The planet Mercury's influence on the likelihoods of Gemini personalities is believed the strongest authority. The actual day you were born on, the twelfth of June is thought ruled by Jupiter's planetary influences accounting for your subtle differences to others of your zodiac sign. Your even temper, uncomplaining manner and wittiness are great assets that let you take life in your stride. Your expressiveness, alertness, enthusiasm and flexibility stimulate you to be a wonderful companion. If you can manage to tame your temperamental streak and find ways to beat boring moments it should make you less irritable. An ending thought for people born on June the 12th is to not be afraid to look into yourself and identify with your good and bad points. This sign on this day is a sign of manipulation and deception. In other words. This Gemini is a liar. How can we trust you? How do we know you're not manipulating and deceiving? Yep... Pretty much all of this is true. I love confirming stuff I already knew about myself. I hope to be better in my life and overcome all of my difficulties. Some things are different but that's because as a Gemini... You tend to be more in tune with the universe. That opens you up to weird emotions that you can not explain. I everyday feel this unnerving connection to the universe. I feel like I belong in a different place and I feel as if I'm destined for something amazing. I want to help everyone and make the world a better place. I want to have peace for everyone on Earth and in the gorgeous universe. That's why I love reading stuff like this. It brings me comfort and affirmation that I'm closer and closer everyday to myself. I know who I am and I am proud of my feelings or per say connections to life. all is true i like it!!!! This soooo true. I can't agree more. It is good. I felt happy reading about myself. Almost 80% is true. this is so true about me. i could not have said anything better! i love who i am and i know that from this day onward i will look at my self even better! i have always dreamed and planned on being in the army and ii am almost to that goal. Well And Good Saying Actually. . .